I'm pleased to be able to share this article which recently appeared in the Australian National Maritime Museum publication. Here it is for your reading pleasure. Thanks to a strange reference to ‘vegetable sheep’ in Joseph Banks’ journal, Don Heussler managed to calculate and confirm the extraordinary power of the telescopes on board HM Bark Endeavour during James Cook’s visit to Australia. LIEUTENANT JAMES COOK’S Endeavour journey of 1768–1771, to Australia and New Zealand, commenced with a scientific expedition to Tahiti. This was to provide a suite of scientific data about a celestial event called the Transit of Venus. Such data, collected accurately from several points on the earth’s surface, would provide the key measurement of the distance between the sun and the earth. It was the time of the Enlightenment, and scientific advances were accelerating. Improving the knowledge of our universe was a key focus of activity. The brilliant mathematical mind of Edmund Halley (of comet fame) had predicted in 1691 that the optimum time for these scientific measurements was 1769. So, really, Cook’s place in history was cast almost 40 years before he was born in 1728. Endeavour carried two types of telescope. Both were the best instruments of their day, because Cook’s voyage was sponsored and organised by two of the major power centres in 18th-century Britain – the Royal Society and the Admiralty. Celestial scopes were larger and designed to be used on land, to reduce or eliminate any movement of the instrument. On Cook’s journey, Venus was viewed using a fine instrument from the workshop of James Short, a mathematician, optician and instrument maker from Edinburgh. His workshop is claimed to have produced 1,360 telescopes during his lifetime. Such a sales volume alone is testament to the quality of his work. Maritime scopes were for use from the ever-moving deck of a ship. Again, Britain excelled in this technology, the major manufacturers being Nairne & Blunt and Dollond. It was these instruments that I needed more information about for my research – what was the magnification available and what was the visual sharpness (acuity) of the best marine telescopes 250 years ago? This data is not easy to obtain. The resolution (don’t excuse the pun) was achieved by referring to instruments still extant today and by consulting an expert. But the real proof came from coincidences found within the great journals of James Cook and Joseph Banks. Within one week, I was able to view two actual examples of maritime telescopes of the 18th century. On view at the time at the ANMM was the exhibition Ships, Clocks & Stars, produced by Royal Museums Greenwich. It displayed an original, beautifully preserved instrument, made in 1774 by Nairne & Blunt, of about one metre in length (unextended). Its label noted that, ‘James Cook had a Nairne & Blunt telescope during his Pacific voyages’. I was not able to get closer to this example than the glass of the display case. The second instrument is a treasure of the State Library of New South Wales and is available for research under controlled conditions. This telescope has a claim to have been actually owned by Captain Cook and has an excellent provenance, from Mrs Elizabeth Cook’s lawyer down to Sir William Dixon, who gave it to the library in 1952. Under the joint care of a librarian, a curator and a security guard, this telescope and I were taken to a secure section of the upper floors of the library so that I could examine its acuity. The curator handled the telescope at all times while I tried to view the spires of St Mary’s Cathedral. All I saw was opaque light – there was an internal malfunction in the instrument. Despite their historical interest and value, neither of these instruments was able to give me any information on its power or acuity. It was time to search elsewhere. The power of the internet put me in contact with Mr Richard Dunn, the Senior Curator in the History of Science at Royal Museums Greenwich in the UK. He said that he had come across advertisements by Nairne & Blunt and Dollond from the period immediately after Cook. These advertised products giving a magnification (×) of 35×, 40× and 45× for daytime use and 75× with attachments for night use. If truth in advertising was adhered to in the mid-1700s, the top-quality British telescopes seem amazingly powerful for the day. Given that these telescopes were freely and commercially available in the 1780s, I contend that limited-production, handmade, state-of-the-art scopes were available aboard HM Bark Endeavour in 1768. It is reasonable that Cook had at least one 40× telescope, and probably several. However, science demands repetition of data to test the truth, or a conclusion drawn from separate and discrete data or via an independent pathway. Mt Egmont (now Mt Taranaki, highlighted) and the track of Endeavour. How intriguing! A distant view of sheep – not native to New Zealand – could have been a show-stopping moment for James Cook, who was in the process of circumnavigating New Zealand, claiming to be the first Europeans to explore it and interact with the Maori population. He was also about to claim these lands for King George III. at this time we were about 3 leagues from the shore which was under the Peaked mountain. Saturday, 13th at 5 am saw for a few minutes the top of the Peaked mountain ... it is of prodigious height ... I have named it Mt. Egmont. On that date, Cook was sailing by the west coast opposite the peak that he named Mt Egmont, but which is now known as Mt Taranaki. 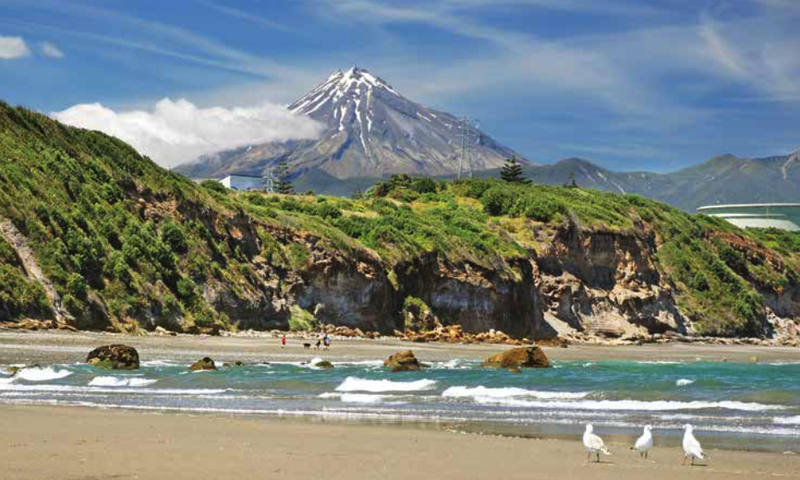 This is a significant volcano 2,518 metres in height, near the vibrant city of New Plymouth. Cook tells us that the ship was three leagues (16 kilometres) from the coast. Modern maps show that the mountain is approximately 20 kilometres from the coast. So Banks’ team was making observations of strange white objects from 36 kilometres away. How does this help us to determine the visual acuity of the telescopes they were using? That’s the really neat part! Rob Mundle starts the explanation in his book, noting of the objects: ‘In fact they were unusual white plants that are now referred to as vegetable sheep’. Again, the internet provides concise scientific information to confirm the data. ‘Vegetable sheep’ is the plant genus Raoulia, endemic to New Zealand. A common species is Raoulia australis, known to occur on the North Island of New Zealand. The plants are a form of pincushion daisy that has evolved to withstand the rigours of alpine environments. They typically grow in distinct colonies, about one metre in size, on the exposed rocks above both the tree- line and grassland areas of New Zealand peaks. The strange name was given to these plants by early European shepherds. The white forms in their distant view (without telescopes) often fooled the shepherds and their dogs, hence the name. From Banks we know that he could not resolve these objects with enough precision to identify them – but he could count them. Therefore we know almost exactly the full capability of the telescopes used. My assessment is that Endeavour’s maritime telescopes were of sufficient power and acuity to distinguish objects (in high-contrast situations) about one metre in size at a distance of 36 kilometres. That is a powerful visual tool. This confirmation of the power and acuity of Cook’s telescopes was only possible because of a series of coincidences. Two hundred and fifty years ago, these were: the observation of a singular mountain, quite close to the coast of exploration; and the sight of the unusual white plants seen by Banks, which only grow at alpine elevations and provide a rare high-contrast subject (white on dark grey rocks) at a huge distance (36 kilometres). As well, Banks’s observations meshed perfectly with Cook’s ship location record and they both mentioned the distinctive landform of Mt Taranaki. In the 21st century, the coincidences concluded with this author, seeking to know the power of Cook’s telescopes, casually reading Rob Mundle’s book and being introduced to the world of vegetable sheep. So here was the answer to my original question, from two different sources: one an expert in England, the other from the very professional scientific and naval expertise of Banks and Cook, who recorded key details of their voyage around New Zealand 250 years ago. But what about the original scientific objectives of the Endeavour voyage, conceived way back in 1691 when Edmund Halley designed the Transit of Venus experiment? The overall scientific results were substantial. When the Tahiti observations were combined with those from other remote locations, they allowed the astronomers and mathematicians of the 1770s to calculate the distance between the earth and sun to be 153 million kilometres. Compare this with the latest modern measurement of 149.6 million kilometres, and you find an error of only 2.3 per cent. This extract is from a new manuscript on the Cook/Endeavour voyage using 21st-century science, technology and scholarship. The full work allows a surprising new assessment of James Cook.